The on-demand car service Uber has a “surge” pricing policy: during periods of peak demand, such as during snowstorms and on New Year’s Eve, prices have increased as much as 8x. Uber’s stated goal of the policy is to increase the supply of drivers and ensure that cars are still available. Although would-be riders know about the policy (and even have to confirm the fare multiplier on their iPhones), it has generated a great deal of mostly negative media attention. To many, dynamic pricing is just price gouging and immoral. Uber’s CEO has argued that other companies practice dynamic pricing (e.g., hotels, airlines, clubs, etc.) and that Uber’s core, unwavering goal is to ensure that a car is always available. These justifications sound reasonable, but are they persuasive? I then had respondents read one of 18 “elaborations” that they were instructed to regard as true. Some of these elaborations were similar to claims made by the Uber CEO or his critics. Each elaboration was a separate HIT and respondents only considered one at at time. Notes: For each bin, a 95% CI is shown for that proportion. The first response of each worker was used. 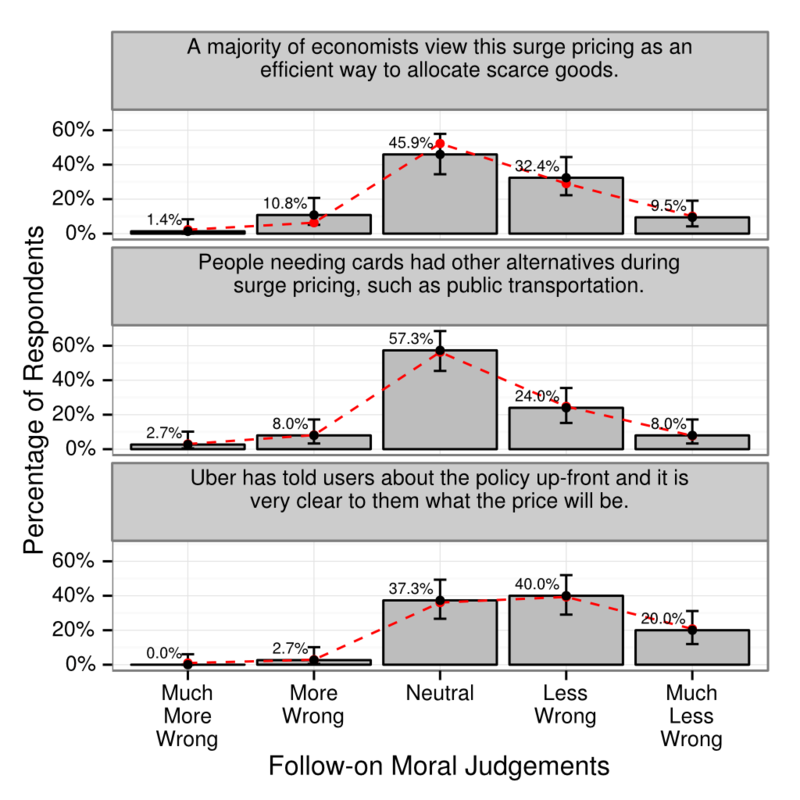 In the figure below, we can see that the (tautological) statement that Uber lowers prices during periods of slack demand improves opinions substantially. Further, stating that the price was determined by an algorithm working against a liquidity contraint also strongly improved views. In contrast, stating that the price was made on the basis of a “guess” by Uber about likely demand made views much more negative. 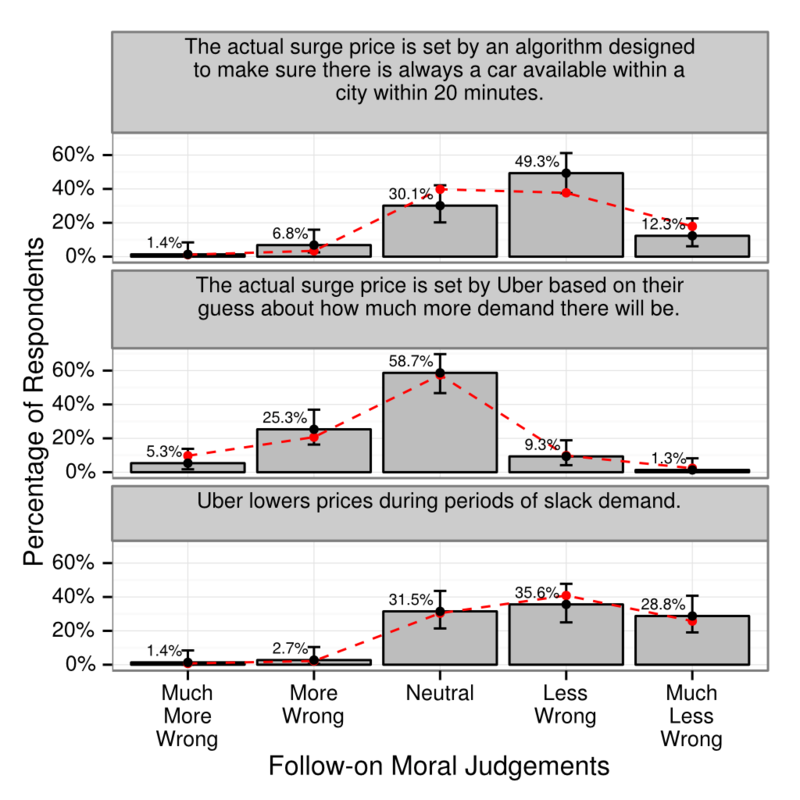 Tighter parallelism between questions would be ideal, but I suspect that three factors made the “algorithm” perspective more persuasive: (1) with the algorithm, high prices were a byproduct rather than a goal, (2) moral agency is transferred from Uber employees to “the algorithm” and (3) the phrasing “guess” implies a lack of care and diligence. Notes:For each bin, a 95% CI is shown for that proportion. The red line shows the predicted proportions from a fitted ordered logistic regression model. In the figure below, we can see that neither hotels nor competitors practicing dynamic pricing does much to improve opinions. 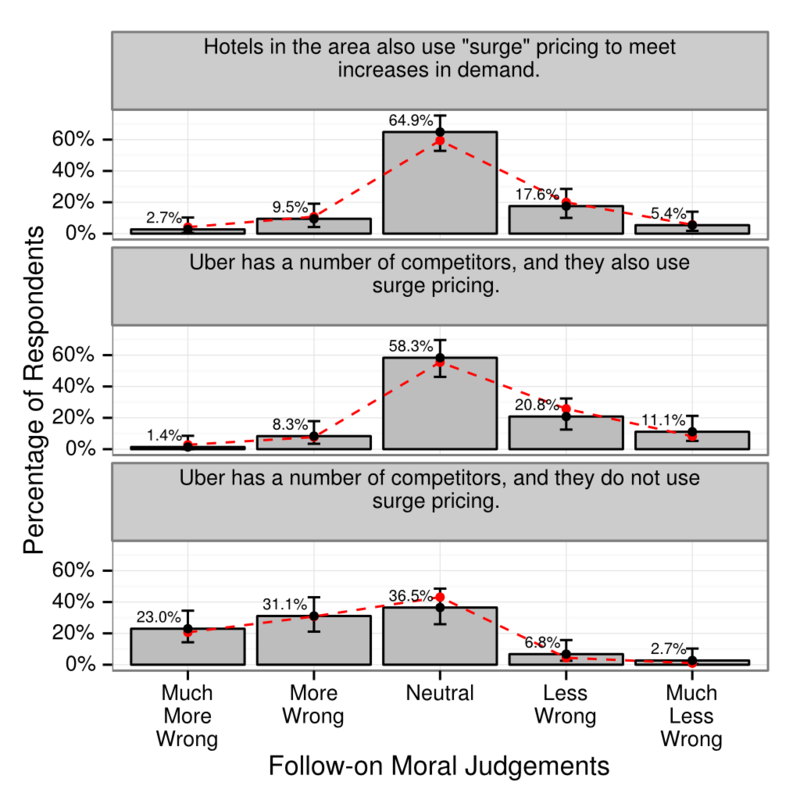 However, the elaboration that Uber practices surge pricing when its competitors do not has a strongly negative effect: the distrbution of responses is very left-shifted toward even dimmer views. It would seem Uber’s best bet would be to hope Lyft starts their own surge pricing (oh look, they did). 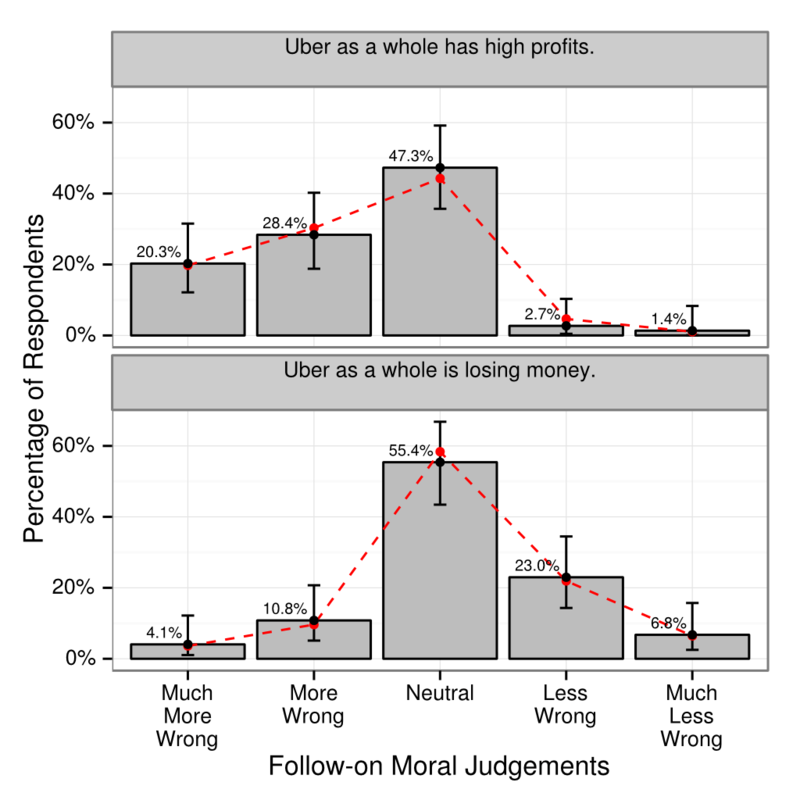 In the figure below, we can see that KKT result is strongly replicated: views are much more negative when Uber is profitable than when it is making money. There are several complexities that I elided over in this post. 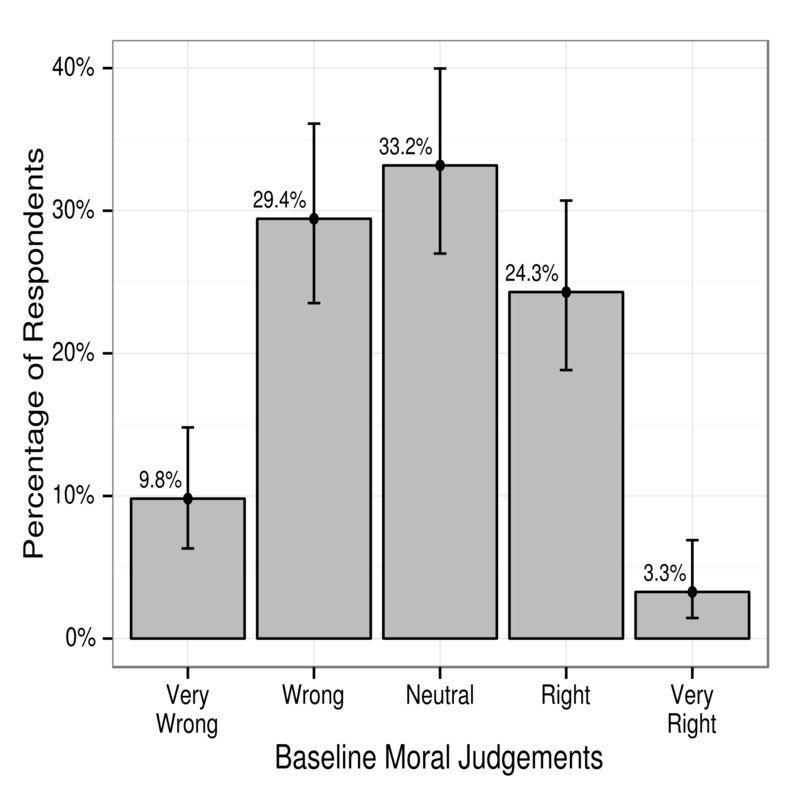 For example, there is the question of how repondent’s prior beliefs affect their willingness to change views (in short, people with negative initial views are less likely to be persuaded, but they have the same directional effects as people with positive views). If there’s interest, I’ll follow-up with some more details in a longer post. I’ll also share a repository with the code, data and experimental materials. This entry was posted in Uncategorized on January 1, 2014 by johnjhorton.